Preparing and processing producer payroll is as intricate as it is important. It’s not as simple as milk in, money out. Producers (and, in some cases, regulators) demand that payments are accurate and on-time. Consequently, handlers dedicate significant resources to the effort because it is time-consuming, multidimensional, and error prone. 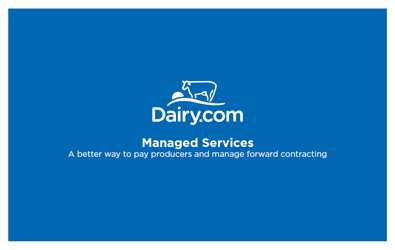 Dairy.com helps handlers tackle the unique challenges associated with producer payroll with an outsourced service platform that leverages our experience and know-how. Our team understands premiums, multiple pay price structures (flat, indexed, FMMO based), assignments (payroll deductions are commonplace) and “labs” (managing and reconciling the testing process). Today, several cooperatives and proprietary processors across the nation count on us to process their payroll. Buyers set pay parameters. Dairy.com does the rest. Downloading the Managed Services flip book is the best way to learn—in about five minutes, give or take—what we offer to today’s dairy professionals. This booklet covers benefits, processes, and other aspects of Producer Payroll and Producer Consulting.